Clear the same colored line in the middle of the screen. 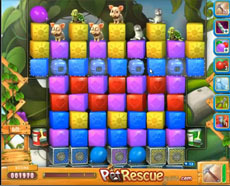 Then use the balloon in the upper right corner to release the pets from their pet boxes and then clear the same colored line it will have been created, to release and the rest of the pets. After this point you have many paint brush boosters, bombs and balloons to help you clearing the blocks under the pets in order to rescue them. In case you find #495 tough you should spend a minute to elaborate our tactic by watching our video!